This is such a great and strong quote. Chris says it to Gordie, when Gordie says that he hates writing stories and that it's stupid. Chris is just saying to Gordie that he's a great guy and he doesn't like writing because his father doesn't like writing. I think Chris is saying that he's there to watch out for Gordie, even though Gordie's father doesn't seem to care about him. I think it says to people that you should help to raise and nurture children. Some people are so easy to say that a child is bad at something or incapable of doing things. People need to nurture and build up children or they will push aside their great skills and talents to appease their parents and teachers. 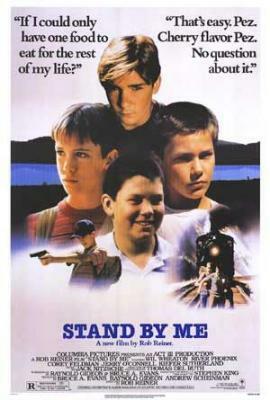 I think that Stand By Me is a great movie that has many great words of wisdom about children. It is a sort of coming of age movie for all boys. In my opinion if you are a boy and have not seen this movie you can never become a man.